TopVue Air are silicone-hydrogel contact lenses with a monthly replacement schedule. Their advanced technology ensures high oxygen permeability for maximum comfort. This package contains six lenses and a 400 ml bottle of Laim-Care solution. 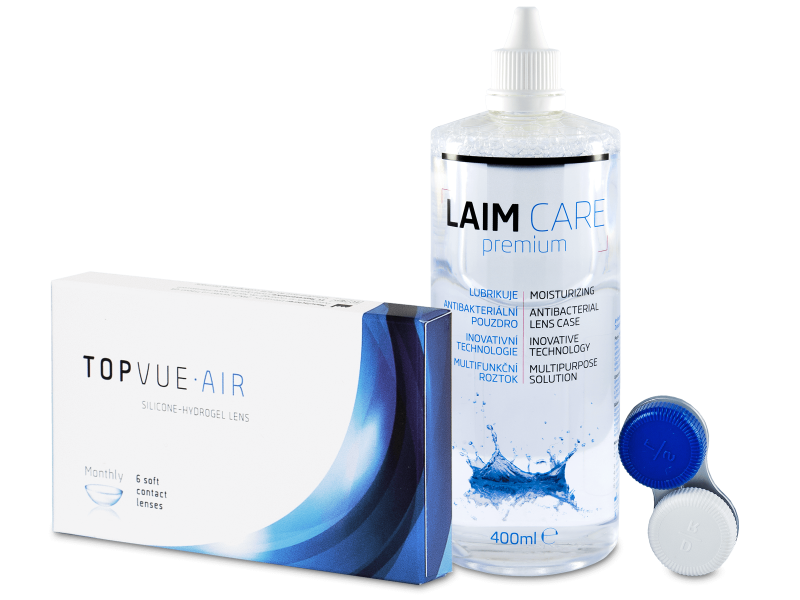 TopVue Air are the latest generation of advanced silicone-hydrogel, monthly contact lenses. TopVue lenses are renowned for their exceptional breathability and hydration. Their advanced lens design guarantees unparalleled comfort and clear, healthy vision. Great lenses - very comfortable to wear. Very helpful service when helping me track my order. Very pleased with the overall service and products. Laim care is the only solution that seems to work for me. Very satisfied to be able to buy it with the topvue lenses as a package deal. Faultless ordering process. Everything easy and I was kept up to date on the status of my order from yourselves and DHL. Excellent. So pleased to find my 2 favorite products bundled together. Thanks for saving me the time when ordering. All my orders have arrived promptly and with no hassle. Quick and easy - from the ordering, delivery and wearing the lenses. They are very comfortable and can not be felt on the eye.